It is not the easiest verse to learn, but over and over again as Abby, our middle child, puts a melody to the scripture, “He hears us… He hears” resonates in my heart. I am reminded that whatever season we are currently in, “He hears us…He really hears!” This truth adds great meaning to my understanding of the Hope I have in Christ. I can cling to that Hope because He truly hears me. 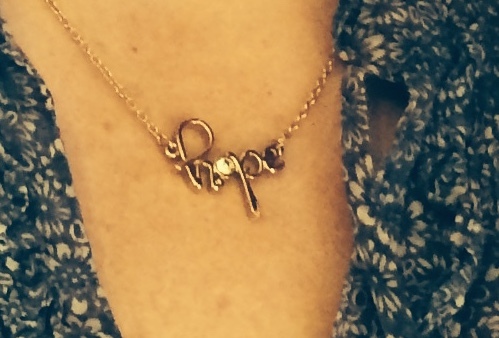 I have been wearing a necklace that keeps the hope of Christ close to my heart. As we patiently wait on partners to send us to the mission field, this necklace has become important to me. And we know that God hears our prayers and yours as we patiently wait upon Him. Continue to pray for people to hear the Holy Spirit and join us in ministry. The kids and I have begun Homeschooling and things are going well. We are concentrating on one character trait each month as a part of our studies. In September we focused on “Thankfulness”. This was Gracie’s choice. As a part of this we would just like to send out a great big “THANK YOU” to all of our supporters!! We thank God for your daily prayers and monthly faith promises which are sending us into the fields of harvest for His Kingdom. Thank you for joining us in the Great Commission to make disciples (Matthew 28:19-20). Terry and I are truly blessed to have this wonderful family living so near. It is good to “hear” them as they continue their journey. Josh, Allison, Grace, Abigail, Simeon…you are covered (and I mean covered from above) by prayer to our Father God. Such a joy to know this family. I for one truly needed to hear this today, as our family waits also we are praying for you guy’s and for God to provide. Blessings to you and the family.